Seeing Green [recipe] – Cin Cin, Let's Eat! My favorite way to eat collard greens is to actually just to braise them with some chicken stock. It’s a simple and really healthy. Wash and clean the greens, cut out the stem that runs down the center, roll up the greens and slice them into 1″ slices. Heat 1 tbsp of olive oil until hot, quick saute of the greens until wilted. Add chicken stock to cover. Cover and let braise over medium heat for 30-45 minutes until tender, season to taste. I cook it a little different each time. Sometimes I saute some bacon pieces first and then toss in the greens, sometimes I throw in a ham hock to braise along with the greens, sometimes I add a dash of apple cider vinegar and/or hot sauce at the end. 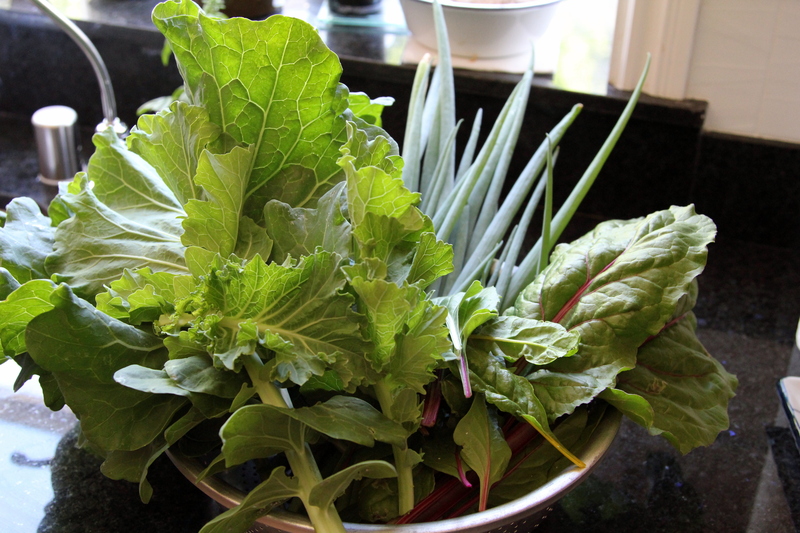 I often add in the rainbow chard from my garden to the greens and they taste wonderful together. Now this next recipe is a real eyeopener for me. I never seem to have any scallions on hand when I need to use some, until I found out how ridiculously easy it is to grow them. Now my biggest problem is to have way too much on hand and not knowing what to do with them. I came across this recipe on epicurious…Scallion sauce? Interesting! And the whole thing took me around 20 minutes to whip up, I even managed to pan-fried two pieces of mahi mahi while all of this was going on. It’s a very intense taste, sort of a mix between onion, garlic, and chives, but nevertheless, very tasty. I would probably add more lemon zest and maybe a little crushed red pepper flakes. But to my surprise, eating it the second day after refrigeration, the taste mellowed out a lot. It went very well with some medium-rare steak slices and a runny fried egg. 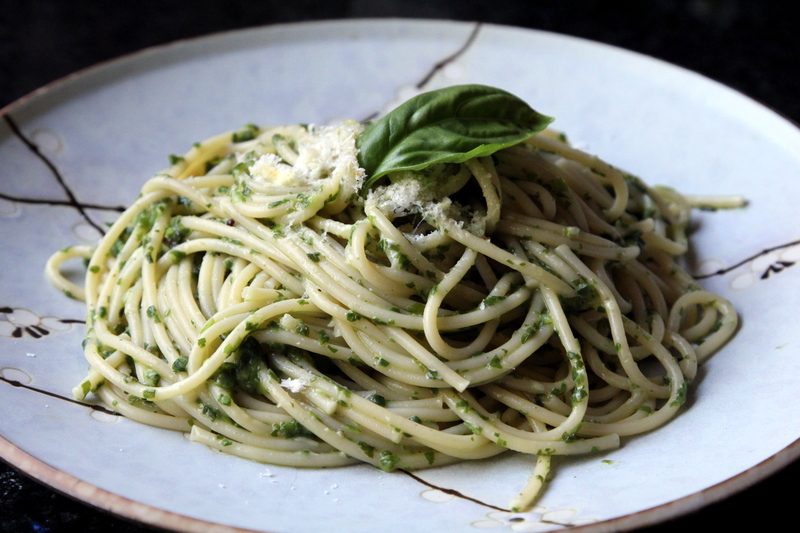 Toss pasta with scallion purée, cheese, and salt and pepper to taste over moderate heat until pasta is well coated. Yum. Green is the new black! Would love to try making the scallion sauce if you have scallions to spare! Lucky you! Those look great. It’s so nice when the garden does well. Love how you use your greens too.